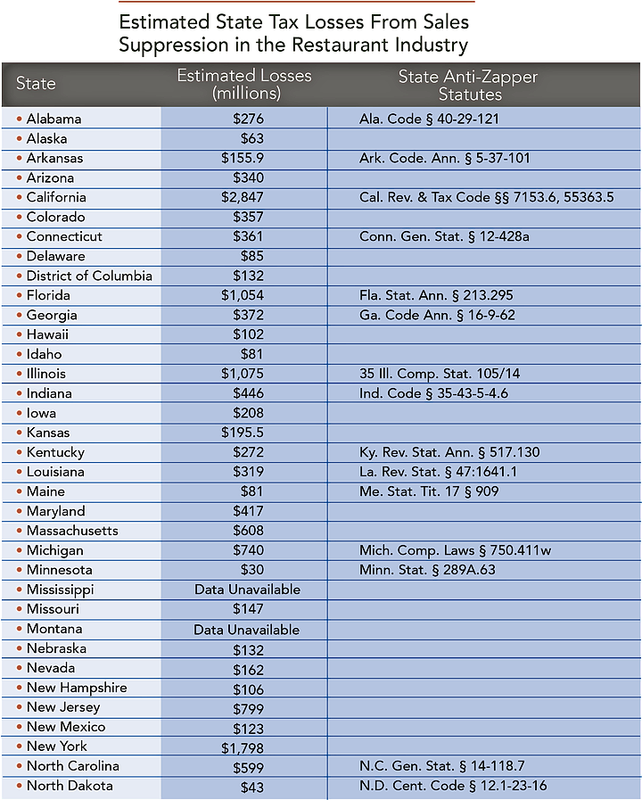 Washington is one of the few states making significant progress in solving a tax compliance problem that robs the states of up to $21 billion annually—but nonetheless confounds even the most persistent state auditors. Success arrived Aug. 30 with the resolution of a criminal case involving Yu-Ling Wong, owner of the Facing East Restaurant in Bellevue, Wash. On the surface, the case reveals a fairly routine example of a small restaurateur using two sets of books to hide cash transactions and avoid $395,000 in taxes owed to the state ( Washington v. Wong , Wash. Super. Ct., No. 16-1-00179-0, plea entered 8/30/17 ). But the Wong case also reveals a pernicious culture of tax avoidance in cash-dominated businesses through the use of electronic sales suppression software, also known as “zappers” or “phantom-ware.” The Wong case represents the first prosecution in the U.S. for a violation of a state law barring the use of sales suppression software (see related story, this issue). In addition, the Wong case demonstrates how a single example of criminal tax fraud was used to reveal a much broader web of crime, potentially involving dozens of small businesses in multiple states. This broader pattern of fraud was revealed in a related federal criminal case targeting John Yin, a salesman for a Canadian company who sold tax zapping software to Wong and other restaurant owners in Washington, Oregon, and California ( U.S. v. Yin , W.D. Wash., No. 2:16-cr-00314-RAJ, criminal judgment 4/14/17 ). And, most importantly, the Wong case points to a new future in the states’ war against a zapper infestation that purportedly infects at least 30 percent of the electronic cash registers, or point of sale systems (POS), in the U.S. This new future could involve real-time electronic monitoring of retailers’ POS systems by revenue agencies. Wong agreed to five years of monitoring in her plea agreement with Washington. “This is historic because it’s the first case anywhere where you have monitoring as part of the settlement in a zapper case,” said Richard Ainsworth, a professor of tax law at the Boston University School of Law. Washington Attorney General Bob Ferguson (D) said the Wong case would “serve as a model for future enforcement” when the state finds retailers using zapper technology. “This case was the first of its kind, but it won’t be the last,” Ferguson told Bloomberg BNA in an email. Sales suppression strategies have been around for decades, but zappers have raised the stakes for revenue agencies. In most cases, Ainsworth said zappers are designed to enter a POS database and delete selected sales, generally cash transactions. The systems then recalculate individual receipts and the taxes due. In addition, the zapper reorders all sales slips and adjusts the internal ledger. This process informs the operator how much additional cash is in the register for removal at the end of the day. Cash withdrawn from registers is frequently paid to staffers under the table. Ainsworth, who has written extensively on zappers, said the most sophisticated systems reconcile differences with the retailer’s inventory systems and financial records. While zappers are common in the restaurant industry, Ainsworth said the technology has infected almost every retail environment accepting cash payments, including bars, convenience stores, liquor stores, car washes, theaters, dry cleaners, and gas stations. No firm data exists examining the rate of zapper penetration in the U.S., but he said the number is much higher than revenue departments believe. He estimated at least 30 percent of all electronic cash registers are running tax zapping software, pointing to research by European and Canadian revenue agencies. Some estimates have asserted penetration rates of 50 percent or higher. All those zappers are impeding tax collections, but the full impact is unclear. 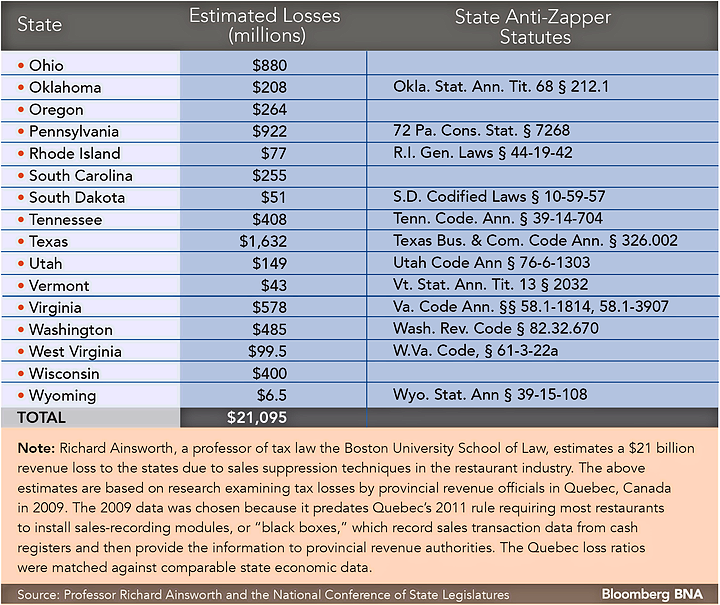 Ainsworth pegged the revenue loss for the states from sales suppression in the restaurant industry alone at $21 billion annually. That estimate is based on research examining tax losses by provincial revenue officials in Quebec, Canada in 2009. The 2009 data was chosen because it predates Quebec’s 2011 rule requiring restaurants to install sales-recording modules, or “black boxes,” which provide sales transaction data to provincial revenue authorities. The Quebec loss ratios were matched against comparable state economic data. While Ainsworth concedes the $21 billion number is a “back-of-the-envelope estimate,” he asserts it may underestimate the losses. Twenty-seven states have passed laws in the last six years addressing the zapper problem. Most of the laws prohibit the possession, use, or sale of tax zapping devices and impose criminal and civil penalties against violators. Matthew Lee, a tax partner with Fox Rothschild LLP in Philadelphia, said criminal cases against retailers have been relatively rare, but the pace of state law enforcement has picked up in several jurisdictions in the last year. The Minnesota Department of Revenue Sept. 1 announced tax fraud charges against Zhong Wei Lin, Dan Xu, Su Ling Cao, and Osaka Duluth, Inc., which operates the Osaka Sushi Hibachi Steak House in Duluth, Minn. The defendants allegedly used zapper technology to underreport $331,000 in sales, triggering a sales tax loss of $27,000 for the state and $7,800 for the city of Duluth. Illinois Attorney General Lisa Madigan (D) announced criminal charges against Sandra Sanchez, the owner of Cesar’s Restaurant in Chicago, on Aug. 2. Madigan alleged Sanchez used a zapper system between 2012 and 2015 to underreport $1 million in sales, cheating the state out of more than $100,000 in taxes. The case marks Illinois’ first prosecution under a 2013 law banning the use of sales suppression software. The Connecticut Department of Revenue Services announced criminal charges July 28 against Xiaoning Fan, who operates the Lao Sze Chaun restaurant in Milford, Conn. Fan allegedly used zappers for eight years to avoid $80,000 in taxes owed to the state. The Fan case marks the first time Connecticut has filed a criminal complaint under its law barring the use of zappers. The Wong case in Washington, however, has captured the attention of many in law enforcement because it revealed deeper levels of fraud that are still being investigated. According to Washington’s original complaint, the Facing East Restaurant went through an audit in 2015 revealing a 7 percent level of cash sales for the restaurant between the years 2010 and 2013. The 7 percent level contrasted with industry standards of between 22 percent and 30 percent and a previous audit, which pegged cash sales at 25 percent. Revenue agents confronted Wong on the discrepancy and issued an assessment for unpaid taxes of $395,000. Wong balked and admitted to keeping a second set of books showing cash sales of 14 percent. Agents, familiar with zapper technology, continued to challenge Wong’s calculations, causing her to confess to a long-term sales suppression strategy. The investigation triggered criminal charges against Wong in February 2016 and a plea deal announced Aug. 30. Wong pleaded guilty to first-degree theft and unlawful use of sales suppression software. She was ordered to pay $300,000 in restitution and POS monitoring by the department for five years. During the investigation, Wong provided agents with information about her use of POS software outfitted with zapper technology. The system was sold and serviced by Profitek SA, a software company based in British Columbia, Canada. Wong also introduced the agents to Yin, the Profitek sales representative who sold and serviced her POS system. The U.S. Department of Justice and the Internal Revenue Service responded with a criminal investigation of Yin, culminating with an indictment in November 2016. The investigation revealed that Profitek’s sales suppression system sold to Wong not only caused a $395,000 loss to Washington, but a loss of $515,500 to the federal government. Subsequent evidence filed in the case pointed to $3.4 million in tax losses from eight restaurants running Profitek zapper systems sold by Yin. The report showed a $2.3 million loss to the federal government and a $1.1 million loss to Washington. Yin pleaded guilty in December 2016 to wire fraud and conspiracy to defraud the government through the promotion and sales of revenue suppression software. On April 14, Yin was sentenced to 18 months in prison and three years of supervised release. Lee, a Justice Department trial attorney before joining Fox Rothschild, predicted additional criminal cases coming out of the Wong and Yin prosecutions. Indeed, state and federal law enforcement sources confirmed the zapper investigation is far from over. Restaurants in California, Oregon, and Washington could face penalties as the case progresses. Court documents show that federal investigators executed search warrants on Yin and obtained a list of “dozens” of restaurant customers, many of whom used the zapper software. Federal agents are conducting a nationwide probe into the use of the sales suppression software with a particular emphasis on restaurants, a federal criminal justice source familiar with the case told Bloomberg BNA. The IRS Criminal Investigation Division (CID) regional office in Seattle has a long history of openly sharing details of closed cases. But when Bloomberg BNA spoke with IRS CID Special Agent Mark Pahnke Sept. 6, he shared no information on the case beyond a few details in public court records and didn’t respond to a query about whether there were any ongoing investigations related to the Yin and Wong cases. Assistant U.S. Attorney Susan Roe, who prosecuted Yin, declined Sept. 6 to comment on the closed case. U.S. government attorneys are precluded from sharing information being presented to grand juries under the Federal Rule of Criminal Procedure 6(e)(2)(B). Another federal criminal justice source also declined comment other than confirming that matters related to the Yin case remain under active investigation. The state of Washington is also engaged in multiple, ongoing criminal investigations of merchants using revenue suppression software to evade taxes, a criminal justice source familiar with the cases told Bloomberg BNA. While the recent state and federal prosecutions are encouraging, revenue officials concede much work remains before zappers are removed from the retail environment. At a minimum, Ainsworth and Garriott said, state revenue agencies need additional manpower and resources. Garriott said zapper cases require “a lot manpower and a lot of patience” at a time when state resources are stretched thin. Terry Horstman, a spokesman for the Illinois Department of Revenue, said Illinois has a high-tech unit that analyzes POS systems seized as part of zapper criminal investigations. But Illinois has also found success focusing on third-party data to make cases against tax-dodging businesses. Minnesota Revenue Commissioner Cynthia Bauerly said revenue agencies also need to think proactively if they hope to solve the sales suppression problem. Bauerly said Minnesota has attacked the problem this year with the Osaka Sushi criminal case and passage of a new anti-zapper statute in July. But the revenue department has also taken an “outreach and education approach” with taxpayers and retail organizations to ensure proper understanding of the sales tax rules and the new criminal penalties. In addition, Minnesota has created a tip line to collect information about potential criminal conduct.